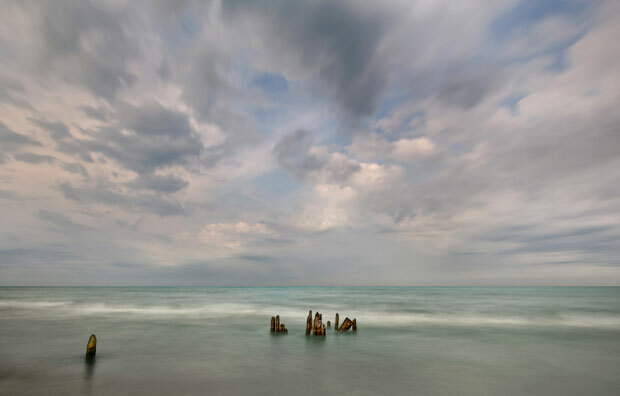 Tim Schroeder’s pictures of the lakeshore capture the eerie effect of Lake Michigan’s receding water levels. 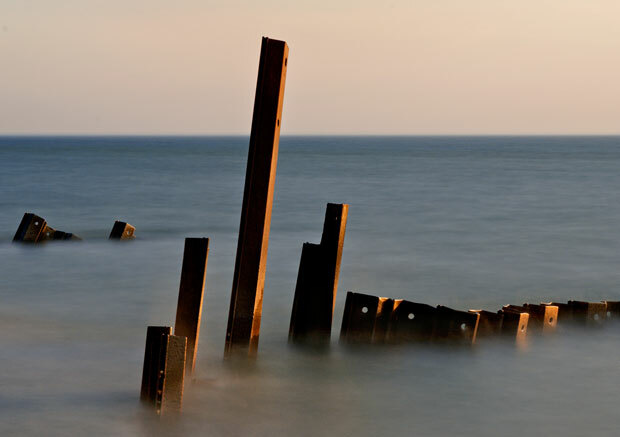 Tim Schroeder is a photographer and long-time resident of St. Joseph, Michigan. Painter Mary Andersen isn’t particularly worried about the water levels fluctuating. 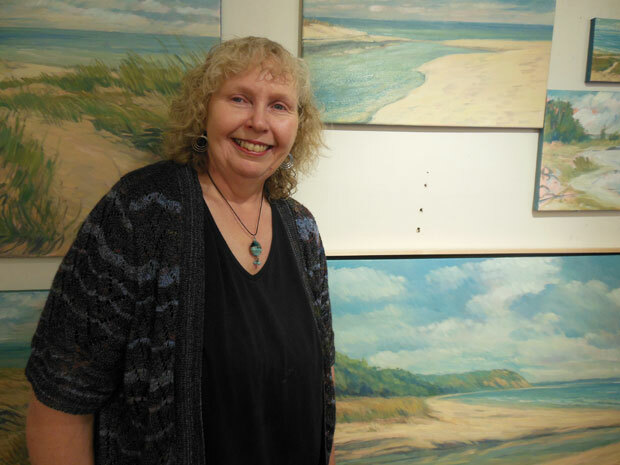 Mary Andersen does most of her painting in her home in Grand Rapids, but she also spends hours at the lakeshore observing. Photographer Tim Schroeder looks forward to a time when human activity doesn’t threaten the Great Lakes’ health. The Great Lakes have been facing some serious challenges, from algae blooms in Lake Erie, to the loss of ice cover in Lake Superior. Water levels in lakes Michigan and Huron have been mostly below their long-term average for fifteen years. At the start of 2013, they hit record lows, but a long winter with a lot of snow and ice has brought the lakes back up. Michigan and Huron, which rise and fall together and have been the hardest-hit by the low water, peaked just around their long-term average in July (although they’re still several inches below their average for this time of year, when the water is typically highest). If the levels in Michigan-Huron stay above the overall average, it will be the first sustained rise since 1998. WBEZ has reached out to scientists, fishermen, shippers — anyone who could shed light on what’s happening. It turns out, some of the sharpest observers of the lake’s wild swings the last few years are artists. We talked to a photographer and a landscape painter, both of whom look at the same lake, but don’t necessarily see the same things. St. Joseph, Michigan is a small town on Lake Michigan about 100 miles from Chicago, a weekend getaway spot. At the beach on a bright day, sailboats cruise out of the St. Joseph river and onto the open water. Tim Schroeder says he comes down here all the time to take pictures, or just to observe. “I’ve done a lot of photographs of fishermen and stuff on the pier, just the mood of the lake, the atmosphere,” he says. Schroeder, 62, has been a professional photographer in St. Joseph for 40 years. The lakefront is always changing, and Schroeder’s photographs show that. They’re kind of eerie, mystical photos featuring rocks jutting out into misty skies, the remnants of rotting piers. “I can see things now that may not have even been visible before, old pilings, breakwaters, stuff like that,” says Schroeder. He says the low water has revealed a lot of visually interesting things that use to be submerged. 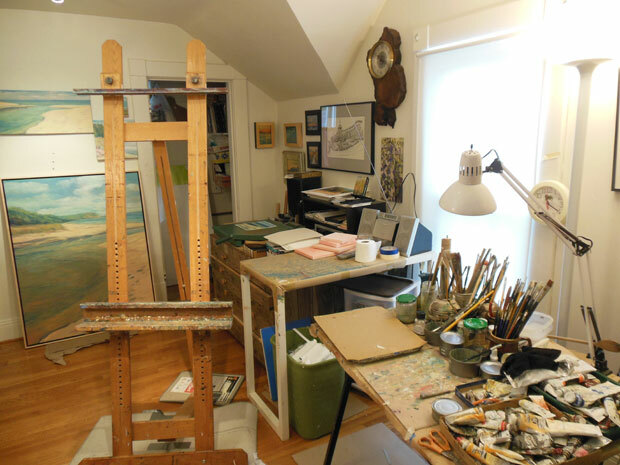 Further north in Michigan, painter Mary Andersen keeps a studio in Grand Rapids. Her house is full of her impressionistic, abstract paintings of the lakeshore, all pale colors and light. She often goes back to the same spot over and over as it changes, and just like Tim Schroeder, Andersen has been watching the lake her whole life. “I grew up looking at it, swimming in it, traveling to the beaches,” Andersen says. Schroeder agrees: The constant transformation is inspiring. But back out at the lakefront, he gestures towards a stepladder that goes off the edge of the pier. It’s the kind you climb down to get in for a swim, but we’re still yards from the actual water and the ladder goes straight into the sand. This change — the water receding — makes Schroeder uncomfortable. 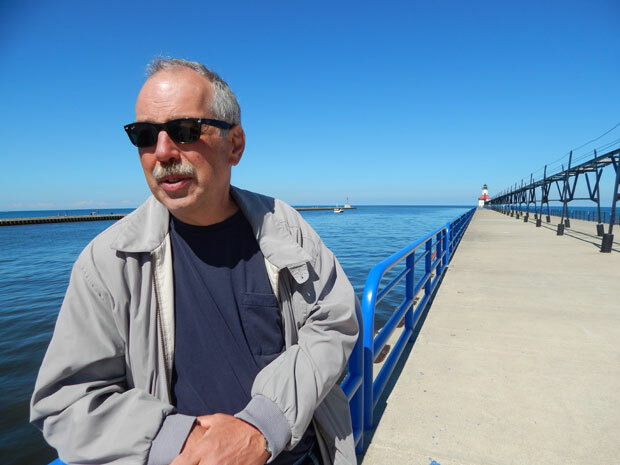 “I don’t like seeing the lake levels lower, because I think it’s a little unnerving,” he says. Like a lot of folks, Schroeder’s not exactly sure why the water tends to be lower these days. Part of it may be man made; a shipping channel on the other side of Lake Huron has been deepened over and over to keep it passable. Most researchers agree that’s lowered Lake Michigan and Huron by 10-18 inches. In general though, lake levels fluctuate based on climate: precipitation and evaporation. The record lows in 2013 were caused by a hot summer and drought, and this past winter’s Polar Vortex, complete with loads of snow and ice, helped bring them back up. But now some scientists are saying droughts and lack of ice cover could cause Lakes Michigan and Huron to stay low over the long run. The Council of the Great Lakes Region (CGLR) commissioned a study of a worst-case scenario. “If we were to see a future, as a result of climate change where water levels in the Great Lakes region would be at their lows for an extended period of time, what would the economic impact be?” asks Mark Fisher, CEO of the CGLR. The report finds cargo ships would have to reduce their loads for every inch the lakes go down. There are also costs for the exposed and rotting infrastructure Schroeder likes to photograph; tourism and the region’s indigenous communities would take a hit, and lakefront property values could also suffer. Between now and 2030, the report estimates a potential economic loss of $9.6 billion in the U.S. and Canadian areas surrounding the Great Lakes. By 2050, it would add up to almost $19 billion across the region. This is just one scenario, and water levels are difficult to predict beyond about 6 months out. But Fisher says many of the estimates are conservative, and regardless, we need to look at the short-term changes as part of a bigger picture. “The challenge with climate change is that it’s subtle, it’s incremental. It’s sometimes hard to see depending on where you are in the basin,” he says. But not everyone is worried about all this — artist Mary Andersen knows the lake better than most, and she says last year’s record low water didn’t faze her. “Because I grew up along the lake, I have witnessed the fluctuation in the lake levels three times over my lifetime, from severe lows to record highs,” she says. In fact, she remembers extremely high water in the 1980s being destructive in its own way, causing erosion on the lakefront, and sometimes flooding low-lying areas. Andersen says she is worried about water scarcity and drought in other places, but she’s not sure about climate change. She thinks the lake’s changes are a natural cycle. “The fluctuation of the lake levels is not our fault,” Andersen says. When it comes to fluctuation, most scientists would agree that it is a natural cycle: The levels have gone from low to high every 10-25 years since humans started recording it about 100 years ago. The concern is that climate change could mean the lows keep getting lower, and the highs never get quite as high. But the extremes associated with climate change means it’s difficult for scientists to predict; after all, in the middle of winter 2012-2013, no one had any idea the lake levels would rise by several feet in just over a year. And, lower water levels is only a piece of what could be coming to the Great Lakes. “It almost feels like death by a thousand cuts to the Great Lakes region,” says Beth Gibbons, the project manager with the Great Lakes Climate Change Assessment for Cities (GLAA-C) in Ann Arbor. She says we need to take stock of what’s coming in order to plan for more climate extremes. Most cities in the region haven’t even estimated the costs. “We can live beautiful lives, we don’t have to mess everything up while we’re doing it,” says Tim Schroeder. Schroeder takes in the scene at the lakefront — it’s quiet except for a few kids, and an occasional charter boat coming into the channel. 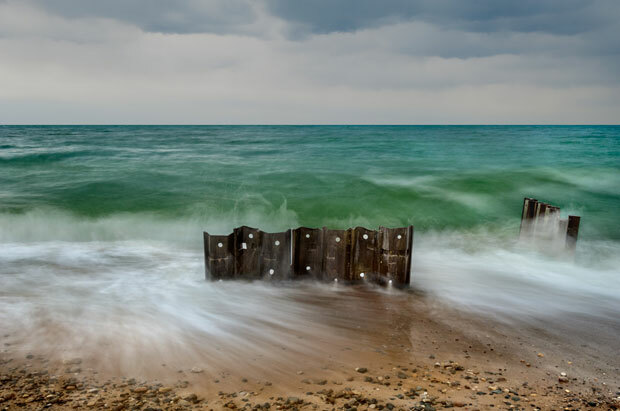 He says he’d love to come back to Lake Michigan with his camera in a hundred years, just to see what it looks like then. Lewis Wallace is a reporter and host at WYSO, the public radio station for Ohio’s Miami Valley region. Follow him @lewispants. Reporter Lindsey Smith of Michigan Radio contributed to this story.